Dave Mustaine is an American singer/songwriter, guitarist, and producer. He was the original lead guitarist for the band, Metallica, but was fired in 1983. After this occurrence, he founded another heavy metal band, Megadeth, and has been the lead vocalist and guitarist for them since. He is also the main songwriter for the band. Here, we shall be looking at the Dave Mustaine hairstyle. 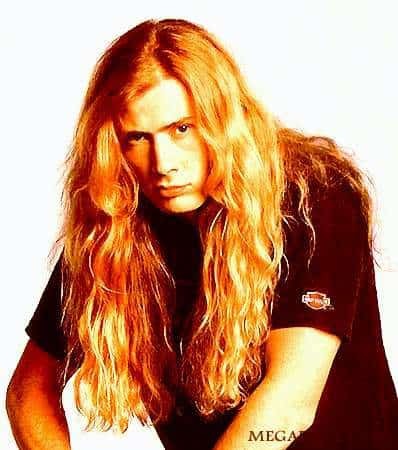 Dave Mustaine heavy metal hairstyle. As is true with most musicians in this genre, Dave wears his hair quite long. It reaches to well below his shoulders, nearing the midpoint of the back. At this length, the hair takes on a wavy appearance that might not be noticeable if it were cut shorter. He parts his hair on the left side and combs the top toward the right. He has allowed his fringe to grow out so that it is nearly as long as the rest of his hair. When he brushes the hair, the fringe tends to cover his right eye. The style is actually a relatively low maintenance option. He can brush it into place and apply a bit of hairspray to hold it in place. This does not require much effort to keep refreshed through the day. He may need to brush it again if he has a very active day. There are some who say that the Dave Mustaine heavy metal hairstyle has not changed since the 1980s. This is far from true. In the 80s, Mustaine wore a mullet like most other musicians of the era. His front hair was considerably shorter than the back. Today, he keeps his hair at a more uniform length that looks better for the most part than the mullet ever did. He may have a permanent put into his hair from time to time. This is because of the amount of curl present in the sides and back. If a perm is used, it is only for the purpose of increasing the wave and body of the hair. It is not to impart a major amount of curl. It is equally possible that the Dave Mustaine heavy metal hairstyle is achieved without the use of a perm. Many men who have seemingly straight hair when it is short find that they have a generous amount of curl and wave in it when they allow it to grow out. A man with hair as long as Dave’s is likely to see this amount of curl without any artificial help. Dave Mustane Amazing Heavy Metal Guiatarist.Good post. I am a Rock Guitarist, and i got hair like that. Before purchasing any washer, always consider how mean to store it. cleansing treatments enable you to ensure your residence or business residential property isn’t really ruined in the process. He has never had a mullet! A mullet is short on the sides! He just had bangs which looked awesome BTW! Your writing an article online yet you have no knowledge of hair! And u forgot to mention that he had layers cut into his hair!